In keeping with Assassin’s Creed Odyssey’s themes of Greek mythology, Ubisoft allow you to take on plenty of godlike enemies. Medusa, for one, is confirmed. The minotaur is thought to be another. But if you fancy a slightly friendlier take on the mythology, you’ll be glad to know that Alexios and Kassandra are able to ride Pegasus. Pegasus is often portrayed as an all-white, winged horse. In Greek myth, the stallion was born after Pegasus killed Medusa, and then headed up to Olympus to serve Zeus. Later, Pegasus was caught by a Greek hero, Bellerophon, and helped to defeat the Chimera. If you’re more of a pop culture fan, you may remember Pegasus from Disney’s animated Hercules film. 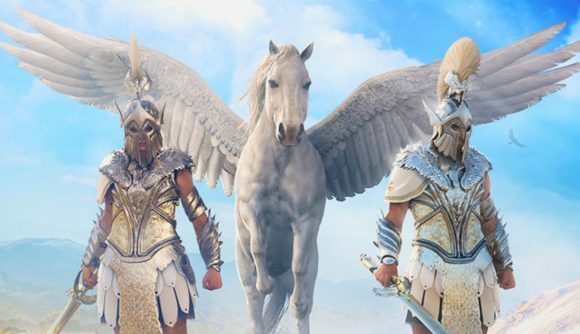 In Assassin’s Creed Odyssey, if you head to the store within the game’s menu, you can purchase the Pegasus armor set. That comes with every piece of armour you’ll need, including a breastplate embossed with an image of the mythical horse and a helmet that leaves a trail of feathers in its wake. Of course, it also comes with a Pegasus skin for your horse, Phobos. In almost all portrayals of Pegasus since the days of Ancient Greece, the winged horse has been able to fly. So imagine players’ excitement when they found out that you could buy Pegasus as a mount in the store. The most recent Assassin’s Creed worlds are veritable feasts for the eyes, so being able to fly around them would be a treat. Except, sadly, Odyssey’s version can’t actually fly. Granted, he tries pretty hard, but it’s all in vain. As you can see in the video below, if you ride your new winged mount off a high cliff, the wings on its back will unfurl and offer a few flaps, but it’s not enough to offer any actual lift. I’m not even convinced it’s enough to prevent you (or your horse) from hurting yourself. I can sense your disappointment, but it is of course worth remembering that you can still take to the skies in Odyssey (sort of). Your faithful eagle pal, Ikarios, is always around if you fancy seeing Greece from a bird’s-eye – rather than a horse’s-eye – view.